My kids are on spring break and we’re heading to Colorado for a ski trip. I’m looking forward to some mountain air and the last bit of snowy weather. I grew up skiing, but have a newfound love for it now that my children are total ski bunnies. It doesn’t hurt that the gear is more comfortable and easier to maneuver. 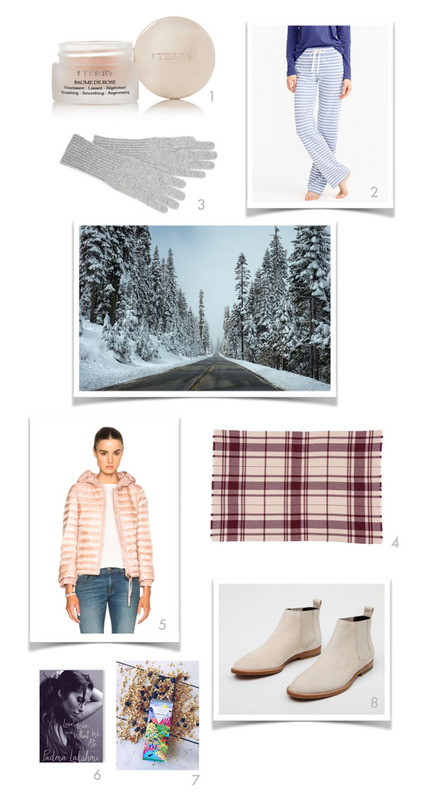 Here’s what I’ll be bringing to stay warm and relaxed on and off the slopes. We’ve taken a few ski trips to Mammoth this year so I’ve gotten pretty good at packing the ski gear. We’ve got all the staples for the entire family stored away in ski luggage – goggles, ski pants, long underwear, after ski boots, etc. This time I’m focused on the few items I often forget. Good lip balm like the (1) Baume de Rose By Terry is a must, hopefully this time I won’t come home with peeling and chapped lips. I love these Dreamy Cotton (2) Pajama Bottoms by J Crew, they’re perfect for lounging in the room, which we’ll be doing lots of. Soft (3) Cashmere Rib Trim Gloves by White + Warren will feel great on the hands both to and from the slopes and this oversized (4) Ladore Scarf by Club Monaco is easy to throw on and you can’t beat the price. On the other hand, although I completely love this (5) Emissole Jacket by Moncler I may have to wait for a sale to buy it. A good book is a must for any vacation, Padma Lakshmi’s new memoir (6) Love, Loss and What We Ate seems like an entertaining choice for a ski trip. Good chocolate, especially this (7) Granola Dark Chocolate Bar by Compartes will keep our sweet tooth satisfied – and how amazing is their packaging?? Finally, I love the (8) Chelsea Boot by Jenni Kayne, with just the right amount of “mountain” feel they’ll pull together my apres ski attire.